Reduce costs by using existing Cat5 cable to provide both power and data. 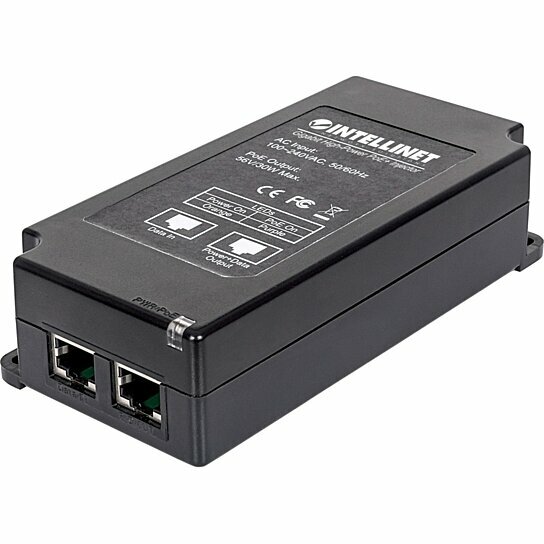 The Intellinet Gigabit High-Power PoE+ Injector allows you to connect your IEEE 802.3af/at-compliant products to a non-PoE LAN switch port. The injector can be used to connect a wireless access point, IP phone, network camera or any IEEE 802.3af/at-powered device (PD) to a switch. The device has an output power rating of up to 30 watts. That's enough for even power-hungry PoE devices. Once DC power is connected to your networked equipment through the Cat5e/6 cabling, the Intellinet PoE Injector ensures that your products are protected from power problems like short circuits (short GRND), current overloads and high voltages.